The annual Concern Spring Run takes place this year on Saturday, April 14, 2012 in Central Park. Each year hundreds of runners and walkers kick off spring with a 4 mile Run/Walk in Central Park to raise money for some of the poorest and most vulnerable people in our world. 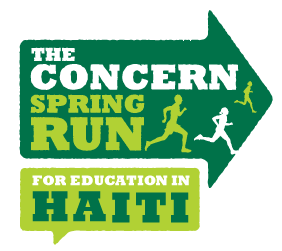 Help Concern reach their goal to raise $155,000 to support their education programs in Haiti. Your efforts will give thousands of children the chance to escape the cycle of poverty through education. In a country where 3.7 million people do not have access to safe drinking water and 8.2 million have no access to latrines or toilets, the standard and quality of education in Haiti is extremely poor. This means that 500,000 school aged children do not go to school. New this year are the Pub Challenge and School Challenge. The pub that raise the most sponsorship will win prizes. The school with the fastest time or largest fundraising team will also win prizes. See rules here. Celebrities Support Spring Run 2012 for Education in Haiti! from Concern Worldwide US on Vimeo.